29 December 1912. Location: Nidhanpur, a village in the Sylhet District of Bangladesh. Nidhanpur, during ancient times, was part of the Kamarupa kingdom of Assam. On this day, while digging the soil for building a buffalo shed, a Muslim cultivator came across numerous copper plates. Surmising these plates to be the clue to some hidden treasure, he took them to a local landholder. The latter recognized the importance of the plates and notified relevant authorities in Silchar, now part of Assam. That’s how the precious treasure was discovered, leading archaeologists and historians know about the historicity of ancient Kamrupa, i.e. present Assam. Inscriptions from the Nidhanpur copper plates originally issued by Bhutivarman and later re-issued by Bhaskarvarman and Doobi (a village in Barpeta district of Assam) copper plates originally issued by Bhutivarman and later re-issued by his descendant Bhaskarvarman throw light on the antiquity of the kings of Assam. The inscriptions tell about the kings of the dynasty of Naraka, Bhagadatta and Vajradatta and their descendants, who ruled for 3000 years. King Naraka of Pragjyotishpur (Assam) finds mention in the Mahabharata. 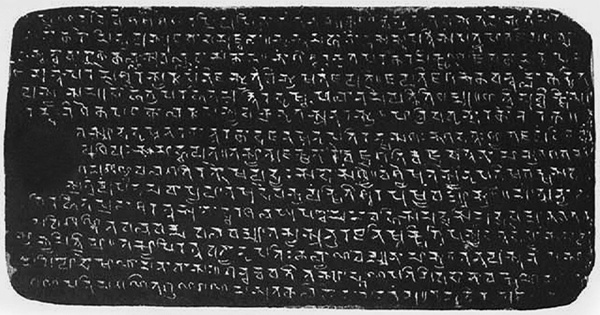 The Doobi copper plate inscription of Bhaskaravarman asserts that Pushyavarman was a descendant of Naraka (of Mahabharata period), Bhagadatta (son of Naraka) and Vajradatta (son of Bhagadatta). Bhabana Deka in Inscriptions as Sources of Early History of Assam mentions about clay seals of Bhaskaravarman in Nalanda. According to him, the seals may have been carried by the bearers of Bhaskaravarman’s letters to the head of the Nalanda University in connection with Hiuen Tsang’s visit to Kamrupa. Likewise, inscriptions from copper plates found in various parts of India further speak volume about the history of Assam.